Cleaning Can Kill You, So Do It Right - Dalton & Co.
Too much of anything can be bad. Too much sunshine and you get burned. Too much dessert and tonight’s gonna be rough. The same goes for something as wholesome as cleaning the house or the workplace. It’s easy to get overzealous and make mistakes that could cost you your comfort and even your life. The Environmental Protection Agency (EPA) places cleaning chemicals into three categories. It’s important to know the difference because some are safer than others, especially around children. SAFEST: Cleaners. These products remove dirt through wiping, scrubbing or mopping. This is the least hazardous type if used improperly. BE CAREFUL: Sanitizers. These reduce microorganisms such as viruses and bacteria, but they don’t necessarily eliminate them. They can include alcohol and may irritate skin or cause illness if ingested. BE VERY CAREFUL: Disinfectants. These are strong chemicals meant to eliminate microorganisms that cause infections. These are most strongly regulated by the EPA. Not reading the label/MSDS before use. At home, you can prevent a lot of the mishaps below just by reading the label first. At work, employers must provide Material Safety Data Sheets to anyone who will be using chemicals that provides detailed information on how to use them properly. Concentrated solutions are more likely to cause skin irritation, and may cause safety issues. Poorly diluted floor cleaner can leave a slick, dangerous surface, for example. Overly diluting chemicals can be just as bad. A cloth with watered down sanitizer will only spread germs rather than kill them. Accidentally using bleach when you think you’re using vinegar, for example, can be very dangerous. When it’s heated, perhaps on a stove, the chlorine in bleach can turn to gas and cause breathing problems, or chemical pneumonitis. Hazardous vapors can build up from a variety of cleaning chemicals. They will cause breathing problems if they are not allowed to escape. Certain combinations are for more hazardous than either substance alone. Rubbing alcohol and bleach creates chloroform, which in great enough quantity can knock you out. The vapors produced by ammonia and bleach can cause severe lung damage. Using chemicals for the wrong purpose. Never knowingly use a product for an unintended use, such as solvents to wash your hands. You could suffer anything from irritation to a chemical burn. Again, this all goes back to #1! If you’re going to be cleaning in a closed space, wear a particle mask to protect your lungs. 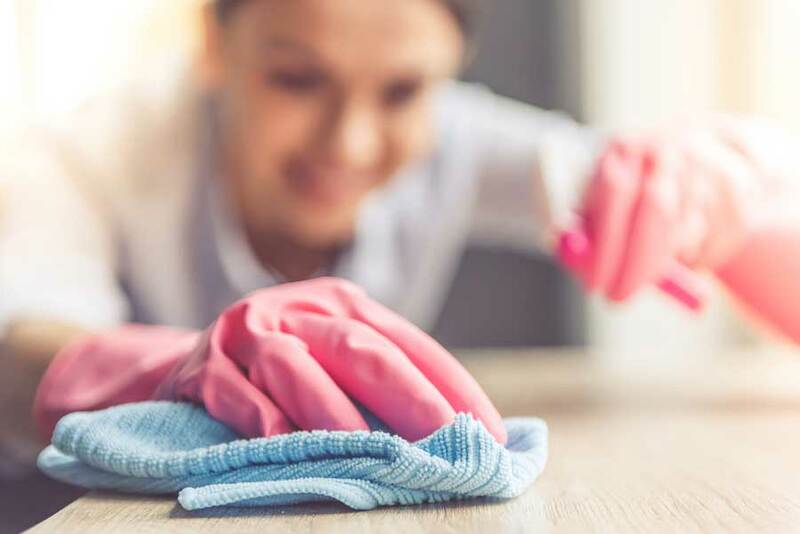 If you’re going to be touching cloths, sponges and other cleaning implements that will be making contact with chemicals, wear rubber or vinyl gloves. And of course, keep cleaning chemicals out of the reach of children. Hey, we know cleaning is important. It’s just not worth dying over. Be safe!